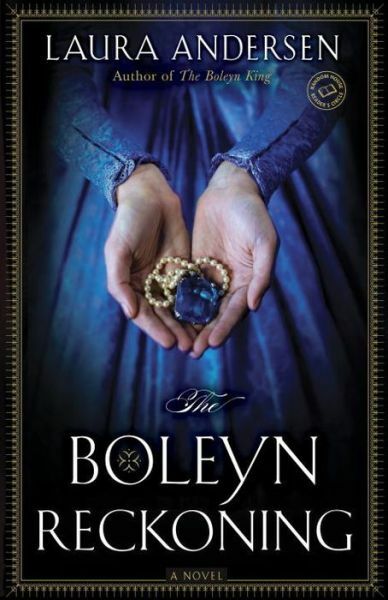 This is the third and final book in Laura Andersen’s Boleyn Trilogy. While I again enjoyed the world Andersen created, I found the second half of the book an emotionally difficult read as misery overtakes all the characters. SPOILER WARNING: There will be spoilers from the first two books in the series, The Boleyn King and The Boleyn Deceit. Anyway, this book focuses mainly on the idiocy of Minuette and Dominic from the end of the last book, where they secretly got married even though Henry IX, known to his friends as William, was making it clear that HE expected to make Minuette his queen. Will breaks his betrothal to the French princess and announces his intentions toward Minuette in a very public yet nonverbal way. For half the book, Minuette and Dominic sneak around, pretending to Will that they are still all the best of friends…and then finally, unexpectedly, he finds out the truth. Not surprisingly, Will loses all trust in his two friends. A little more surprising is his newfound distrust of his sister Elizabeth and just about everyone else as well. Then, he just devolves into the same sort of monster his father really was in history, but wasn’t in this alternate universe. Oh, and he has to deal with a Catholic rebellion, too, which offers up a whole lot of traitors to execute but doesn’t help his mood any. MY TWO CENTS: The first two books, and some of this book, were almost light and fluffy in their handling of the subject matter. The second half of this book is somewhat hard to take as Will becomes brutal. I realize that he is stunned, hurt, and betrayed. He leaves the couple alone at first, and you’d think this would allow him time to start getting over it. But no, this time of rebellion just underlines how he doesn’t have his friends at his back (in fact, they stabbed him in the back) so he just loses his anchors to humanity. He finds ways to torture his friends (and his sister), physically, mentally, emotionally…did I already say “monster?” Yes? Well, once isn’t enough. What I do find enjoyable, as I have throughout all three books, is Elizabeth. Her character is so similar to the real Elizabeth’s–her intelligence and leadership is apparent. What’s different is her aversion to marriage, as her parents’ legacy in this universe is one of loving partnership and not betrayal and murder. It will be interesting to see this Elizabeth come front-and-center in the author’s next books. BOTTOM LINE: I didn’t love this book as much as I did the other two, but I still enjoy this world Andersen has created and look forward to her continuing it in The Sovereign Trilogy. TEACUP RATING: I give this book 4 to 4½ out of 5 teacups. I just feel Will’s actions made for such an unpleasant read that I docked a few points. I wish the author could have found some way to salvage Will, but I fully understand why she couldn’t and didn’t. ON SALE DATE: This book will be released in paperback and e-book formats on July 15, 2014.